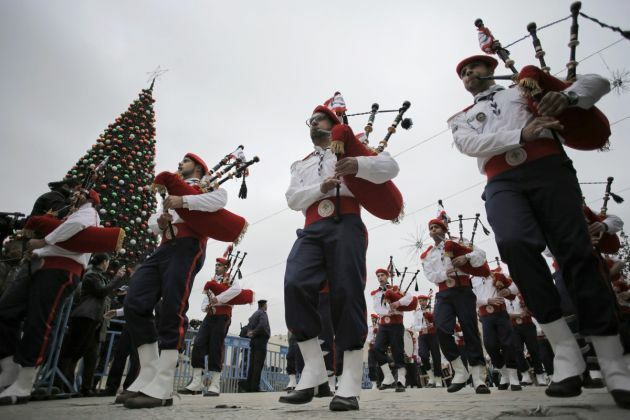 (Photo: REUTERS / Ammar Awad)A Palestinian marching band takes part in the Eastern Orthodox Christmas procession outside the Church of the Nativity in the West Bank town of Bethlehem January 6, 2015. Orthodox Christmas celebrations have started in Bethlehem as hundreds of Orthodox Christians, pilgrims and clergy paraded in the Nativity Square to receive patriarchs and bishops. The Greek Orthodox Patriarch of Jerusalem Theophilus III arrived January 6 at Manager Square, marking the start of Christmas Eve celebrations according to the Julian calendar, the Palestinian News and Information Service, WAFA reported. The Assyrian, Coptic, and Ethiopian churches also celebrate Christmas on January 7 according to the Julian Calendar which marked an earlier date than the Gregorian Calendar followed by most Western churches. The Holy Land is unique in celebrating Christmas three times; on December 25, January 6 and 7 and January 19, the Jerusalem Post writes and weather forecasters say it may be snowing. While much of the rest of the world enjoys their after-Christmas sales, in the Holy Land, two more Christmas holidays are yet to come, the newspaper says. The Holy Land is unique in celebrating Christmas three times December 25 (for Roman Catholics, Protestants and some Orthodox Christians), January 6-7 (Orthodox churches) and January 19 (Armenian Orthodox only in Jerusalem). Russians and Ukrainians will also celebrate Christmas on January 7. Patriarch Kirill of Moscow and All Russia was to conduct the divine service on Christmas Eve in the morning and the liturgy on Christmas Night, the patriarch's press service said. Armenians have claimed an enduring presence in Jerusalem dating back to 95 BC and a community on Mount Zion since the fourth century, the Jerusalem Post reported. They were one of the first communities to adopt Christianity in 301 AD. Today the Armenian population living in the Armenian Quarter in the Old City of Jerusalem totals around 2,000 residents. Theophilus III was welcomed by the Orthodox priests and parishioners from Bethlehem, Beit Jala and Beit Sahour at the Tomb of Rachel, also known as the Bilal bin Rabah mosque. He then made his way to Manager Square, where he was greeted by Bethlehem Governor Jebrin al-Bakri, Minister of Tourism Rula Ma'aya, Bethlehem Mayor Vera Baboun and Presidential Advisor for Christian Affairs Ziad Bandak, WAFA reported. The Patriarch was also greeted upon his arrival by hundreds of Orthodox locals and pilgrims waiting at Manager Square before making a solemn entry into the Basilica of the Nativity. The Church of the Nativity is administered by three churches, the Roman Catholic Church, the Greek Orthodox Church and the Armenian Church.